The intent of this handbook is to provide an overview of the methodology that we have developed known as Visible Ops. Since 2000, we have met with hundreds of IT organizations and identified eight high-performing IT organizations with the highest service levels, best security, and best efficiencies. What was most amazing about these eight organizations was what they shared: a common way of managing change, a culture of causality, and value placed on controls that were both visible and auditable. Visible Ops reflects the lessons learned about how these organizations work and describes a control-based entry point into the world of ITIL. 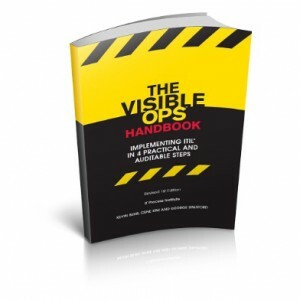 Organizations can use Visible Ops to springboard their own process improvement efforts.